Wouldn’t it be nice to click the heels twice and end up at the Gucci fashion show February 22nd in Milan? There’d be no place like that fashion home! 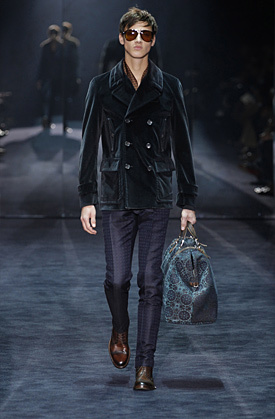 Gucci’s creative director Frida Giannini calls the fall 2012 collection,”a dark glamour…,” with its dark shades of jewel tones: blue, plum, burgandy and a striking green. OH…and there’s tons of black! But, not a simple black…there’s velvet, silk, leather, feathers, and tapestry. Don’t miss out on Gucci’s bags for men.